Losing your Android Phone when you are having a lot of Personal as well as business stuff is the worst situation ever. You lost your phone and now you are worried about the phone reaching the wrong hands. Wait, Don’t panic, you got the second option, too. 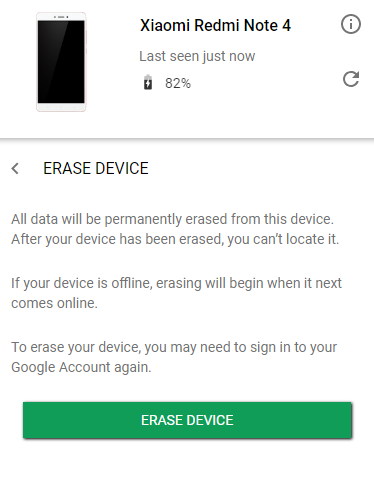 Well, In this article you will find How you can remotely erase all your phone’es data if it is lost or your just misplaced it or even someone stole it from you. Recently, I shared an article where I discussed Finding your Lost or Stolen Phone with the help of Find My Phone. 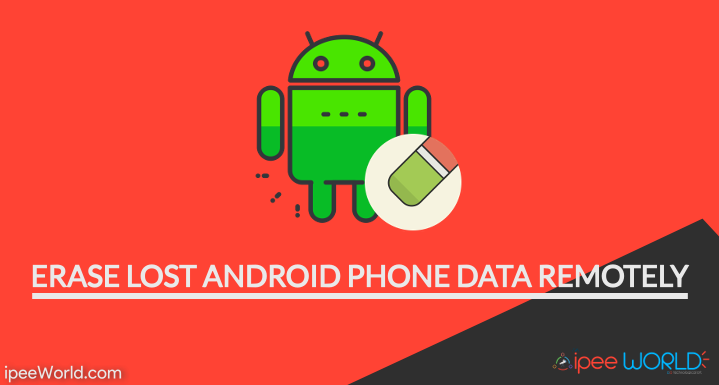 If you have tried all the possible methods mentioned in the article and even then you are not able to find your Phone back then erasing the data is our final resort. By erasing the Data completely from the device, the device will be factory fresh with absolutely no personal data including Photos, Videos, Contacts, Documents, Apps or pretty much nothing in general. You can track your Mobile with the Mobile Number as well. As we have done everything on finding our phone and sadly we are in bad luck. Next is to save all your Personal data from reaching it in wrong hands. Continue reading the article if you want to erase all the data in your phone remotely with even having the need to touch the phone. So, let’s get started. 1.1 Is it really possible to erase data remotely? Be sure to install the App called “Find My Phone” which is available in the Google Play Store. This is the App that we going to use for erasing the data. Make sure that the app is installed in your device. Although, this will work even if the App Find My Phone is not installed in your device. But for better precision and Location settings it is recommended that you keep this app installed in your device. Who know’s what’s gonna happen to your device the very next moment. Is it really possible to erase data remotely? Actually, Yes. You can remotely delete or erase all of your data which are active in the device. But before we go deep into the article just go to the below section where it tells the basic requirements that one’s phone should meet to erase the data remotely. And finally, your phone must be connected to the Internet Network. It doesn’t matter if it is a Mobile Network Connection or WiFi, your phone should have an active Internet Connection, only then we will be able to erase the data remotely. As mentioned earlier your Phone must be connected to the Internet via Mobile Data or WiFi. And after all the other main thing is that your Phone must be associated with a Google Account. That means you should be logged into your Google account from that Android device which we need to find or erase for now. Erase Device option here means a complete Factory Reset of your Android Smartphone. Every personal data and file stored in the Internal Storage of the device will be eares and deleted completely, It will include all your files, contacts and Apps. However, Data and FIles on the SD Card or the external storage won’t be affected by this. Only your Phone’s Internal storage will be wiped off. So, keep that in mind. As soon as you press the Erase button, it will automatically erase and wipe all the data from your phone will do a clean Factory Reset. If you were not able to connect to the device and the Deletion process didn’t start. Probably, this will be because the Phone may not be connected to an Active Internet Connection. If you meet with a situation like this. Just wait for a few mins and repeat the step for some time. Who know’s when your device gonna be online. As mentioned, an Internet connection is a must for this to happen. This is how we completely erase all data from our Android Phone which is either Lost or Stolen. As soon as we hit that Erase Device button, it will perform a clean Factory Reset which will completely wipe all Data that is present in the Internal Storage of your Device. I repeat, Data in your External Storage will not be affected by this Earsing and only data in the Internal Storage will be affected by this Process. What so ever, we will be at least able delete all data from External Storage. Hope you guys found this article useful, Be sure to comment if you face any problem or have any doubt.